While Cleveland is commonly perceived by outsiders to be an industrial town bereft of vacation destinations or attractions of interest to kids and their families, the urban center of Northeast Ohio is actually filled with a variety of impressive parks and activities designed and operated with pint-sized visitors in mind. If you’re considering a visit to Cleveland in the near future with your family, these are ten of the attractions you won’t want to miss. 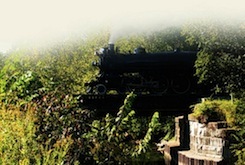 Cuyahoga Valley Scenic Railroad (Independence, OH 44131) – Kids with an affection for trains are sure to love a trip on the Cuyahoga Valley Scenic Railroad, which winds through Cuyahoga Valley National Park and along the Cuyahoga River. There are several stations from which you can board the trains, and special programs like the Underground Railroad that impart history lessons along with the excitement of train rides and scenic beauty. Cleveland Botanical Garden (Cleveland, OH 44106) – Teaching kids about sustainable living, the importance of green living and instilling a love for nature requires a bit of time exploring the flora and fauna, which is why a trip to the CBG should be moved to the top of your must-do list while your family is visiting Cleveland. The Hershey Children’s Garden alone, which features a wheelchair-accessible treehouse, is worth the trip. Great Lakes Science Center (Cleveland, OH 44114) – The vast majority of exhibits at the Great Lakes Science Center are interactive, hands-on installations that allow kids to experience natural science concepts for themselves. The Indoor Tornado, Bridge of Fire and Polymer Funhouse are all perennial favorites of the many small-statured visitors that make unforgettable memories at the Great Lakes Science Center each day. Money Museum – Federal Reserve Bank of Cleveland (Cleveland, OH 44114) – What better way to supplement lessons in money management and financial responsibility than a trip to the Federal Reserve Bank of Cleveland? Learning about spending, bartering and other forms of trading are among the potential lessons at the Money Museum, which can be experienced in a rushed forty minutes or a leisurely few hours over the course of an afternoon. Cedar Point Amusement Park (Sandusky, OH 44870) – Roughly and hour’s drive west of Cleveland Hopkins International Airport lies Cedar Point, an amusement park that consistently finds itself on “Best Of” and “Most” lists. While older kids are sure to flip for the world-class roller coasters, little ones can get in on the fun at Planet Snoopy. The West Woods (Novelty, OH 44072) – The West Woods is a beautiful park in Novelty, Ohio, but also serves as a resource and learning center for those interested in conservation and ecology. The Geauga Park District employees are both kind and knowledgeable, as well as eager to answer any questions posed by kids and adults alike. A Christmas Story House (Cleveland, OH 44109) – While younger kids may not be familiar with the iconic house featured in the slightly off-color Christmas film classic A Christmas Story, older kids are sure to be delighted by a tour through the house, where Randy’s snowsuit and other props are displayed. The gift store on the property also sells reproductions of the infamous Leg Lamp, naturally. Museum of Contemporary Art Cleveland (Cleveland, OH 44106) – If you’re hoping to instill a bit of appreciation for modern art in your brood, a trip to the Museum of Contemporary Art Cleveland may be just the ticket. Kids under twelve are always admitted for free, and the museum frequently hosts workshop and family programs for the younger set. Memphis Kiddie Park (Cleveland, OH 44144) – Few things will delight little ones as much as Memphis Kiddie Park, which includes eleven miniature amusement rides designed specifically for kids less than fifty inches tall, an arcade and a miniature golf course. Lake Metroparks Farmpark (Willoughby, OH 44094) – Kids will be so excited at the prospect of milking a cow, observing a busy beehive in action and getting up-close and personal with more than fifty farm animals that they may not even realize they’re in the middle of agricultural and farming lessons. Don’t miss The Great Tomato Works! There are plenty of things for the youngest members of the family to do and see in Cleveland, but that doesn’t mean that the grown-ups are left out. In addition to the many museum and performing arts cultural centers in and around the city, Cleveland also boasts an emerging culinary scene and more golf courses per capita than any other city in the United States. 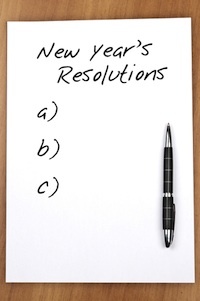 New Year’s Eve is almost here, and with that brings the famed New Year’s resolutions. Adults everywhere are reflecting on the past year and looking ahead to the next, finding places where they can improve their lives. Parents often make big plans to change habits and behaviors with this fresh start, and these plans often include their children. Here are a few New Year’s Resolutions you could work with your child to make. Keep my belongings organized – The first thing that parents need to recognize about this resolution is that it very likely means something very different to your child. Children typically have unique ways of keeping things organized. This frequently stirs friction between child and parent because mom and dad might believe “organized” means that everything is folded, put away neatly and out of sight, while their child might consider things organized if he can find his underwear in the morning. This is a great opportunity for parents to connect with their child. Sitting down and discussing the differences between your view of organization and theirs can actually help a child if it is done though positive conversation. Giving him freedom in this area can go a long way in helping him discover what his organization style is. If there are rules in common areas, parents should be clear about those, but should also allow their child to control how he organizes his own space. This will help him learn to keep it all together. Drink water with every meal. Most people do not drink enough water; this is true for adults and children. Telling a child she cannot have soft drinks or juices anymore will cause aggravation in the child and will only work to make her sneak them elsewhere. By setting the rule that everyone drinks water with each meal, this healthy liquid is introduced without the ban on other drinks altogether. Practice the sport, art or activity of their choice for 30 min every day. Everyone has hobbies or skills they want to improve. Children often beg parents for lessons to learn to play piano or be in basketball, but after the first few weeks of lessons, the excitement fades when they learn they have to practice. Parents can help their children set the goal to practice by finding their own new skill to work on. This way parents and children can work in unison to improve themselves in at least one way. I will talk to one new person every week at school. This is a great resolution for the child that has a hard time making friends and connections. It can seem like a leap of faith for a timid child to make new friends, which is why it is so important to start with just one conversation. Maybe only one in every five conversations end in some kind of friendship, but then in a little over a months’ time your child will have a new friend and be confident enough to make more. I will try one new food a week. Children tend to eat the same foods every week. This is due in part to the fact that these foods are easy to make and because parents are tired of fighting with their children to eat new and more healthy foods. This approach addresses the problem in steps. It does not require the child eat entire meals that he hates, just one new food a week. Make the new food three or four times during the week so that he gets a chance to try just one bite a few times. Parents should try to make the experience fun and set a good example by eating the food alongside him. I will help one person every day without being asked. Generosity is a character trait most people believe is absent in children these days. Parents can inspire the development of this habit by encouraging their children to find one person to help or to do one helpful activity each day without being asked to do it. Keep a chart of these activities and praise the big-heartedness that it brings. Try to avoid “rewarding” these activities with material positions because part of generosity is not expecting anything in return. Instead give rewards with kind words and gratitude. Change is best done with someone else. If parents want to encourage their child to make these transformations, the best way to do so is to make the changes along with their child. Find one or two small changes that you and your child can work together to make, then connect and talk about the successes and the challenges of altering this habit every week. If you do, then by this time next year both you and your child will be healthier, happier and more connected to each other. The Mile-High City offers a variety of exciting attractions for vacationing families, all nestled in the stunning natural beauty of the Rocky Mountains. If you’re considering Denver as a destination for your next family vacation, you may be surprised at the number of kid-friendly activities there are to choose from. These ten attractions are among the best, but are still only a small sampling of the many exciting options available to families visiting Denver. The Butterfly Pavilion (Broomfield, CO 80020) – Billed as an “insect zoo,” The Butterfly Pavilion and Insect Center is one of the jewels in the Denver metro area’s kids’ attraction crown. More than 1,600 free-flying butterflies float flutter through the Wings of the Tropics conservatory, which also houses plenty of tropical plants. Keep in mind that touching the butterflies is not permitted, and be sure to warn little fingers away from the temptation to catch one of these beautiful creatures before arriving at the facility. Chautauqua (Boulder CO 80302) – Though President Teddy Roosevelt once said that chautauquas were “the most American thing in America,” there are now only three left in the nation. The only chautauqua west of the Mississippi is in Boulder, housing a dining hall, community house, cottages and an auditorium. Miles of hiking trails, plenty of family-friendly events and lectures are among the available activities, which are sure to take up the better part of an entire day. Denver Botanic Gardens (Denver, CO 80206) – While the Denver Botanic Gardens sprawl over twenty-three acres and features more than 1,500 plant species, the three-acre Mordecai Children’s Garden and Pipsqueak Pond are the highlights for families with kids in tow. After entering through a cave, children emerge to find six gorgeous environments that encourage fort-building, wildlife observation, harvesting and arts and crafts activities. Denver Art Museum (Denver, CO 80204) – Recognized internationally for their family-friendly programs and environment, the Denver Art Museum is a great stop on your family vacation. Don’t forget to pick up Family Backpacks on Saturdays and Sundays, which are filled with games and gallery-related activities and ideas for keeping kids engaged while learning the finer points of art appreciation. Lookout Mountain Nature Center and Preserve (Golden, CO 80401) – Interactive exhibits, walking trails and activities that encourage learning about environmental and nature conservation are scattered over the one-hundred and ten acres of Lookout Mountain Nature Center and Preserve, which also houses Buffalo Bill’s Museum and grave. Elitch Gardens Theme Park (Denver, CO 80210) – Just across the highway from the Mile High Stadium, home of the Denver Broncos, lies Elitch Gardens Theme Park. More than forty-five rides, attractions and shows, along with a water park to which admission is included with the theme park price, make the trip a great stop for lighthearted fun while you’re in Denver. Don’t miss the Ferris Wheel, which provides a breathtaking view of both the city and the Rocky Mountains. Children’s Museum of Denver (Denver, CO 80211) – Divided into a variety of “playscapes,” the Children’s Museum of Denver is a great escape for kids of all ages. The first floor houses the Center for the Young Child, which caters to kids from newborn to age four, and the Parent Resource Center, which is rife with information about parenting. There are so many activities that you should plan to spend the better part of the afternoon here, especially after kids discover the My Market and Assembly Plant exhibits. Four Mile Historic Park (Denver, CO 80246) – Denver’s oldest house, Four Mile House, is listed on the National Register of Historic Places and situated on the twelve acres of Four Mile Historic Park. Dedicated to celebrating the diversity of the men, women and children that helped to build the West, there are a variety of activities and attractions for kids and adults alike to be found. Tiny Town Colorado (Morrison, CO 80456) – If you want to truly awe the youngsters in your family, take a trip to Morrison, Colorado in order to visit Tiny Town. Comprised of more than one hundred structures built on a one-sixth scale, the town can be explored by riding the authentic steam locomotive. Parfet Prehistoric Preserve Triceratops Trail (Golden, CO 80401) – There’s something about even the mention of dinosaurs that tends to captivate and inspire kids, which makes a visit to Triceratops Trail a great choice for your family vacation. A simulated dinosaur dig, the Trek Through Time exhibits and Dinosaur Ridge are all exciting options for kids and adults alike. Explore millions of years of Colorado history over the course of a single day! If there’s a sports connoisseur or two in the family, be sure to keep in mind that Denver is one of the few cities in the United States with teams from four major sports, including the NFL’s Denver Broncos, the NHL’s Colorado Avalanche, the MLS team Colorado Rapids and the MLB’s Colorado Rockies. No matter what time of year you schedule your visit, chances are you’ll be able to catch a professional-level sporting event while you’re in Denver with your family. Most people go through periods in their life when they feel sad over a loss, a difficult relationship or a struggle they’re facing at work or at home. 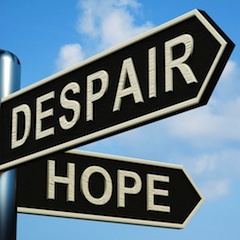 When feelings of sadness go on for several days or more, when they go from feeling blue to feeling helpless, hopeless and worthless or when those feeling interfere with a person’s daily life, sadness may have turned into clinical depression, a serious and treatable medical condition. According to the National Institute of Mental Health, approximately 14.8 million American adults, or about 6.7 percent of the U.S. adult population suffer from depression. It affects women more than men and it’s the leading cause of disability in the United States for ages 15 to 44. Nannies, like everyone else, are susceptible to depression. Employers should be aware of the symptoms of depression and encourage or require their nanny to be evaluated if they’re concerned about her mental health. It’s important to understand that a person who displays the common signs of depression may not be suffering from depression. Medications and other illnesses can cause similar symptoms. Only a mental health professional can accurately diagnosis depression. So what should parents look for? Here are some questions to ask yourself about your caregiver to help you determine if she might be depressed. Does she have difficulty concentrating, remembering details, or making decisions? This may show up as a usually organized and on the ball nanny appearing to be off her game. She may have a hard time focusing on what you’re asking her to do when you review the weekly to do list. She may forget small details like adding something to the grocery list or more important details like early dismissal for a teacher conference at your child’s school. She may have a hard time deciding if she should stock up on a favorite grocery item while it’s on sale or if she should let your child go on an afternoon play date with a mom she just met. If your nanny is suddenly having a problem concentrating, remembering details or making decision, it might be a sign she’s depressed. Is she fatigued or has decreased energy? If your normally energetic nanny is now tired all the time, it may be a sign of depression. Does she barely drag herself into the house each morning or is she excited to start the day? Is she engaging with your child throughout the day or has she become more of an observer, leaving your child to entertain herself? Is she and your child spending time at the park, the zoo or with friends or are they spending the majority of the day at home by themselves? Ongoing tiredness may be a sign of depression. Is she irritable? When a nanny who normally lets the normal stresses of the day roll off her back now gets easily frustrated and irritated, it might be a sign of depression. Of course everyone is going to have a bad day now and then, even your very patient nanny. However if it’s happening on an ongoing basis it might point to something more serious. Has she lost interest in activities or hobbies she once enjoyed? Even parents who don’t have a close relationship with their nanny have a sense of what the nanny enjoys doing in her off time. In the usual “What are you doing this weekend?” conversations, the nanny may talk about the craft fair she’s attending, her new class on modern art, or her new role as her son’s soccer team assistant coach. If your nanny no longer shows an interest in the things she used to be so passionate about, it might be a sign of a larger problem. Is she overeating or has she lost her appetite? Even though most parents don’t spend many mealtimes with their nanny, it’s easy to see if she’s losing or gaining weight. If it doesn’t seem to be a conscious effort to shed extra pounds, it might point to a depression issue. If your nanny is exhibiting these symptoms of depression, she might be clinically depressed. Or she might not be. It’s critical to remember that only a professional can accurately diagnosis clinical depression. However if you see these symptoms in your nanny, talk with her about it. Open, honest communication between a parent and nanny is always the best approach to any problem or concern. It’s in everyone’s best interest that the nanny be given appropriate treatment if she is suffering from depression or any other mental illness. The holidays, despite all the cheer they bring, are typically a stressful time. From mid-November though the New Year there is a never-ending list of things to do, so it’s really no surprise that life gets overwhelming for many parents. Luckily, there are a few ways that you can limit that stress and free up a little time for yourself. Send Happy New Year’s cards – Who ever said that you have to send Christmas or Hanukkah cards? Gifts, decorating and parties need to be done before the big day, but sending cards is one thing that can wait. Why not make a plan to send Happy New Year cards to your family and friends instead? Your children will (hopefully) be occupied for a few days after they open their gifts, which can help free up some of your time. Use this time to send off those cards to people; you might even have a little more time to send them a personalized message with the card! Shop online – Just about every retail establishment has a great online store these days, which makes finding gifts, ordering them and shipping them out easier than ever. Most stores even deliver wrapped gifts, making your gift packaging complete. 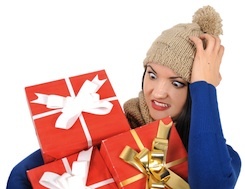 Shipping is often times free for larger purchases, and many stores offer great holiday deals. Buy from local small business stores – During the holidays, big box stores and malls are always crowded and frustrating to visit this time of year. While they have great deals, it’s not always worth the headache to fight with the crowd to get what you want. Shopping at the store down the street can not only be less stressful, it can also bring you a sense of satisfaction that you are doing something good for your community. Creating these new local acquaintances will help you feel more rooted in the community, which can add joy to your life and your family. Limit Gifts –Create a list of who you want to get gifts for and how much you would like to spend – and actually stick to it. This can be very difficult, but every time you are tempted to buy something else for someone, consider returning the other items you have purchased for them. If you add someone to your list, make sure doing so is something that you really want to do. If funds are tight, resist the pressure to add people to your gift list. Give and receive gifts of donation – Opening a gift from someone is really fun, but finding the perfect gift, wrapping it up, and giving it to someone that you know can bring even greater satisfaction. Sometimes parents feel they have too much stuff. Consider asking your close friends and family to donate to a charity that you strongly support in place of giving you a gift. If you know that your friend has a lot and really doesn’t want more stuff, donate to a charity that she supports frequently herself. Then present the receipt as a gift. You would be surprised how much this gesture will be appreciated, especially if it is a charity you carefully picked specifically for her. There are a lot of practical steps you can take to ease the pressure you feel during the holiday season. Remember the reason you celebrate this season in the first place and what it means to you to be with family. Make things a little easier for yourself, because in the long run if you are happier and more at peace, your whole family will have more fun as well. Limit Commitments – Yes, there are some things you cannot say “no” to. However, there are plenty of activities that you can take a pass on. Make a list of all the people you want to see and parties or events that you went to last year or know that you have to go to this year. Put a star next to the ones you feel like you “have” to go to. Highlight those you are really excited about going to. Then take a look again at those on the list that you put a star next too. Ask yourself what would really happen if you did not attend that event or see that person before Christmas. The reality is that people tend to go to events around this time of year simply because they think they are obligated to attend. But in order to make the holiday season more enjoyable for you and your family, some things might have to go. Enjoy the simple things – Parents often want their family to have a flawless and seamless holiday experience. You frantically search for the perfect gifts, decorate the house with millions of lights and adornments, and sacrifice to get your child to every possible fun occasion you can. However, your children seem to not even notice or appreciate all your hard work. These activities are not always the things that create lasting memories for your children. Talk to your children if they are old enough. Ask them what really matters to them during the season. If they are not old enough, think back to your own childhood. What made those memories special for you? Was it that they were picture-perfect, or was it that you spent them with the people that you loved? Try to pick a few simple things and focus on doing those. Reject the pressure you feel to do everything to make the season picture-perfect. 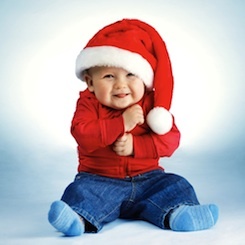 Remember your childhood celebrations with accuracy – Often times the reason that parents push themselves to “do it all” during the holidays is that they remember all the things that they did when they were kids. Try to look back at your childhood with more detail about the events that meant so much to you. Did you love going out to see the Christmas lights? Do you remember it being amazing? Do you also remember freezing and complaining the whole time? When parents plan these events for their families, remembering only the great things about their own childhood experiences, there is an expectation that their kids will understand the meaning behind the tradition, have a great time, and say only nice things to each other. This is something out of a movie that is often not reality. Set your expectations according to the understanding that even though you look back at your childhood holiday traditions with love now, in the moment you probably complained (almost) as much as your children currently are. Then, when your children complain that they are too cold and want to go home, it does not hurt your feelings or cause you stress. You know that you now look back at those times with fond memories, and you can have faith that someday they will too. Look at the holiday through your child’s eyes – It is so easy in the hustle and bustle of getting everything done to forget what it is like to be a child during this season. Whatever holiday your family celebrates during this season, your child will look at it with great anticipation and delight. No matter how many toys your child says that she wants, remember that what she wants most is more time with you. With a few small adjustments to your outlook, you can not only make it through the season, but do so with joy, finding yourself refreshed on January 1st instead of exhausted and in need of a vacation. The sixth largest city in Texas, El Paso, is situated along the United States-Mexico border adjacent to Ciudad Juarez, Chihuahua. The diverse community is home to many citizens that speak Spanish predominantly, which can make the city a great destination for a family vacation when one or more members of the household are in the process of honing their Spanish language skills. Among the many activities and attractions suitable for kids in the area are these ten, which only scratch the surface of things to do with kids in El Paso. El Paso Zoo (El Paso, TX 79905) – Developed under a “total immersion” concept, the El Paso zoo was designed to transport visitors beyond the confines of the city surrounding the campus. The open space park allows kids to run and play as they observe animals in a simulacrum of their natural habitats, providing plenty of opportunities to expend excess energy while exploring the basics of life science. Magoffin Home State Historic Site (El Paso, TX 79901) – Less than a mile from the U.S.- Mexico border lies the Magoffin Home, a Texas Historical Commission property that serves as both a stunning example of Territorial-style architecture, a museum celebrating the life of a multicultural family that was instrumental in the community and the only house museum in El Paso. Wyler Aerial Tramway (El Paso, TX 79930) – Kids are sure to love a ride on the Wyler Aerial Tramway at Franklin Mountains State park, with a few that spans seven thousand square miles, three American states and two separate countries. Experience the natural beauty of the American Southwest from great heights, with an informed cabin attendant acting as tour guide. El Paso Museum of History (El Paso, TX 79901) – Promoting an understanding of the rich cultural diversity of the border region through a variety of exhibits, installations and educational programs, the El Paso Museum of History is a great stop if you’re looking for a bit of educational fun on your Texas journey. National Border Patrol Museum (El Paso, TX 79924) – Learn about the history of the United States Border Patrol, from the earliest days of the Wild West through the present at the National Border Patrol Museum and Memorial Library Foundation, where a variety of exhibits showcase the organization’s past. There’s no admission fee to tour the museum, but donations are gratefully accepted. War Eagles Air Museum (Santa Teresa, NM 88008) – Just across the Texas border into Santa Teresa, New Mexico is the War Eagles Museum, a sixty-four thousand square foot building filled with military aviation artifacts from the World War II era and beyond, along with a selection of antique automobiles. Western Playland Amusement Park (Sunland Park, NM 88063) – Cross the border into New Mexico to find this amusement park, with a variety of classic and modern ride attractions to choose from. Great for a bit of lighthearted fun after touring museums and sites of historical significance, the short lines and relatively low-traffic park is a fun way to spend an afternoon. El Paso Museum of Archaeology (El Paso, TX 79924) – Aspiring archaeologists will flip for the El Paso Museum of Archaeology, with it’s focus on prehistoric Southwestern culture. Most of the collections are centered around prehistoric Southwestern and Northern Mexican prehistoric artifacts like pottery, basketry and sandals, as well as some Mesoamerican and Native American objects. Wet ‘N’ Wild Waterworld (Anthony, TX 79821) – A variety of waterslides, wave pools and a dedicated Toddlers Cove area in nearby Anthony, Texas offer plenty of opportunities for relief from the heat of the border region, which may be especially oppressive to those unaccustomed to such weather. There’s plenty to do for younger kids and older ones alike, so be prepared to spend the better part of a day here. 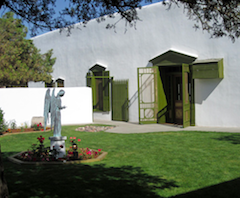 Mission Valley Visitor Center (El Paso, TX 79907) – Along the El Paso Mission Trail lie the two remaining mission churches of Ysleta and Socorro, along with the presidio Chapel of San Elizario. The Mission Valley visitor Center in El Paso is an ideal place to begin your exploration, as there’s plenty of Mission Trail information available from the knowledgeable staff who are eager to point you in the right direction and answer any questions. The close proximity to Mexico makes it tempting and somewhat easy to cross the border, turning your little ones into international travelers by journeying just a few additional miles. Keep in mind, however, that there are certain risks you’ll want to take into a account before making the trip, and that the area may not be as safe. Be sure that you have all of your travel documents in order, including passports, before crossing the border and that you’ve done an adequate amount of research about the area. The ages of your children. Some nannies are open to any age, but most nannies have a preference as to the age of the children they care for. Some love babies, while others prefer the toddler set, and others enjoy school-age children. In your profile, list the ages of your children, if they’re a boy or a girl, and also if you’re planning on having or adopting another child in the near future. A little bit about your child’s personality. Giving some details about what your child is like, what she enjoys doing and what she struggles with is a wonderful way to personally connect with the caregivers reading your profile. 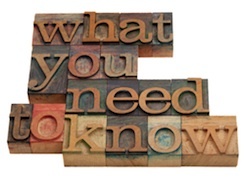 Often a brief description will spark a nanny’s interest and be the thing that makes her reach out to your family. Any responsibilities that are outside the normal nanny duties. Nannies expect to take on typical nanny duties, like feeding your child healthy meals and snacks, doing the children’s laundry, keeping the play room tidy, and any other tasks related directly to the care of the children. However, if your job includes extra duties, such as cooking family meals, grocery shopping, taking care of the pets, or running errands, it’s important to include those in your profile. It helps nannies know if your job is one they want to pursue. The hourly rate or salary you’re paying. This is one of the first things nannies will look for, not because they only care about money, but because they want to make sure you’re in the same money ballpark they’re in. If you’re paying your nanny legally (and it’s always a good idea to! ), include the term “gross wages” in your description. This will let nannies know that you’ll be withholding taxes and the amount they’ll bring home is less than what’s stated. What you’re looking for in a nanny. Are you looking for a nanny with at least two years of infant experience? Is it important to you that your nanny have a college degree? Do you only want to talk to caregivers that love the outdoors and enjoy hiking and biking? Talking about what you’re specifically looking for in your profile will help nannies know if they’re a good fit to your needs. A brief overview of your discipline philosophy. Being aligned with your nanny regarding discipline issues is an important part of a successful relationship. Share with potential candidates how you approach setting boundaries, handling challenging behaviors, and communicating your wishes to your children. Important information about the work environment. Every nanny has different preferences about the household she works in. By telling applicants that you’re a stay-at-home mom, that your mother-in-law lives with you, or that the house is under major construction you’ll give them the information they need to decide if your household is one they’ll be comfortable working in. If you’re hiring a live-in, a description of the living quarters. The living space provided by a family is a deciding factor for live-in nannies. Make sure you include what rooms the living quarters include (e.g. private bedroom, kitchenette), if any of those rooms are shared by other members of the household or guests, and if there’s a separate entrance from the nanny’s quarters to the outdoors. Include any pets you have. Some nannies love pets and look for them in a job. Other nannies either don’t like animals or have allergies that make working with dogs and/or cats difficult. It’s best to let nannies know about all pets you have in advance so there are no game-changing surprises later on in the process. Some examples of the things you’d like your nanny to do with your child. Giving nannies a sampling of the type of activities you’d like to see your child involved in gives her a clearer picture of what your needs are, what your child enjoys and what her day-to-day job would look like. Be sure to state if your nanny will be expected to drive your child to and from outings. With a well written profile that is rich in details, you’ll greatly increase your chances of finding a good match for your family in a short amount of time. Tis the season of gift giving! This year, rather than taking the kids out to the stores to find gifts for family members, why not have your children make gifts for their grandparents, aunts and uncles instead? 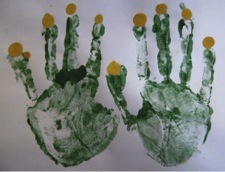 Crafts made from prints of your child’s hands, feet, and even thumbs are treasured keepsakes that are held onto and brought out years later when the children are grown. Here are a few fun and memorable ones to try during the holiday season. This craft could be put on any number of objects. One idea is to try it on a bag and use it as the wrapping of the other gifts you give out. This beautiful ornament, which is incredibly simple and cute as a button, is one that will be treasured for years. Write the child’s name and age on it to remember when it was made. This also makes a great “babies first Christmas” treasure. There are many versions of this simple craft, some with the fingers pointed up, others with the fingers pointed down. 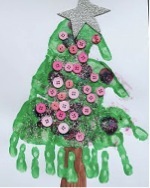 The fun part of this craft for your child is gluing all the objects onto the tree. You could put just about anything on there, from glitter to buttons like you see here. How sweet would it be for grandparents to receive this adorable craft for babies first Christmas? This is a different take on the footprint. 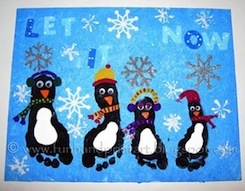 You might not even know they were footprints if it weren’t for the tiny toes peeking out from under the silly penguins. Children will love dressing the penguins up. 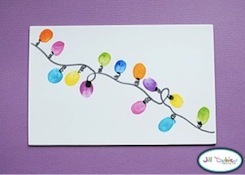 This is a fun project for mom and dad and is great for families with two or more children. 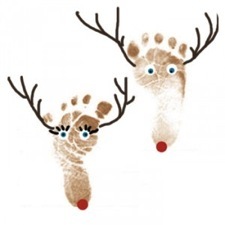 You could even have everyone in the family put their footprint on the paper to make a little Reindeer footprint family. Your preschooler will love this easy craft. Children can pick their colors and place them wherever on the page they want. Then they can have fun tracing the line to attach them all to make the cord. 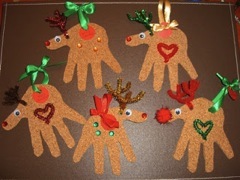 This craft would be great for children that have learned to master the scissors, but if they haven’t then parents or caregivers can help them cut out all the handprints. 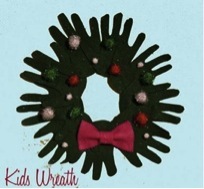 Make the wreath out of felt and glue it to cardboard for a gift that will be sturdy and last a long time. 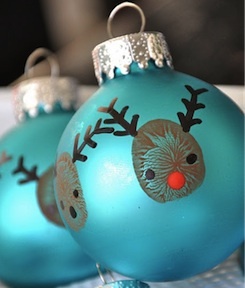 This ornament would make a great project for preschoolers as a yearly keepsake. One fun tradition would be to have your child make one every year to see how she grows from year to year. 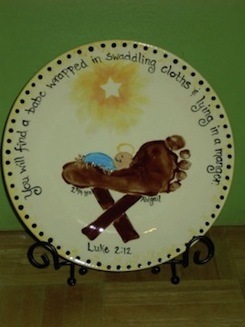 This engaging image of baby Jesus laying in a manger is made out of your child’s footprint. It certainly looks eye-catching on this ceramic plate, but you could just as easily have it on paper or some other medium. 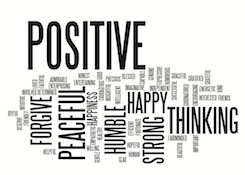 The graphics are simple enough to reproduce and you can use whatever words you would like. This is a great way to celebrate Hanukkah and include your children. You could have your child place his handprints beforehand and each night of Hanukkah he could then place the flame above the finger. You could even use your child’s thumbprint for the flame. 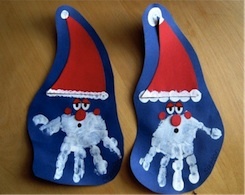 I hope this has given you a few ideas for crafts to do with the kids over the holidays. Have a happy crafting holiday!